The Senate is poised to vote on former oil lobbyist David Bernhardt’s confirmation as official Interior secretary. 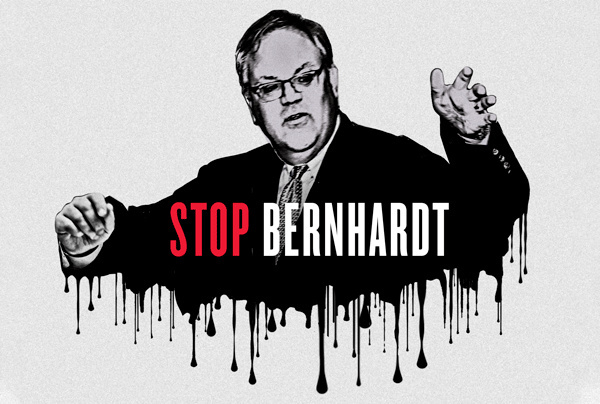 As acting secretary, Bernhardt has shown that he’s more interested in serving the interests of the oil companies that he used to lobby for, like Halliburton, than those of the American people. He has pushed for oil drilling off America’s coasts and in Alaska’s Arctic National Wildlife Refuge … advocated for rolling back the Endangered Species Act … weakened limits on climate-busting methane for oil and gas companies … and supported dismantling our national monuments. We must mobilize a massive outcry in opposition to this dangerous nomination. Take action NOW by urging your senators to vote NO on Bernhardt’s confirmation — and tell them that we won’t stop fighting to protect our public lands, oceans, and wildlife. The Senate is poised to vote on former oil lobbyist David Bernhardt’s confirmation as Interior secretary. Urge your senators to vote NO and keep fighting to protect our public lands and waters. Dear Senator: I'm writing as a constituent to urge you to oppose David Bernhardt's confirmation as Secretary of the Interior. Bernhardt's long history lobbying for the fossil fuel industry raises serious ethical questions as to whether he should be head of the agency tasked with safeguarding our national monuments, oceans, wildlife, and climate against those same corporate polluters. Time and time again, Bernhardt has shown that he's more interested in serving the oil companies that he used to lobby for, including Halliburton and Samson Resources. As acting secretary, Bernhardt has pushed for oil drilling off America's coasts and in the Arctic National Wildlife Refuge, advocated for rolling back Endangered Species Act protections, weakened limits on climate-busting methane for oil and gas companies, and supported dismantling our national monuments. Bernhardt's actions and allegiances make him unfit for this vitally important job. I and thousands of people across the country are outraged by this dangerous nomination. I urge you to listen to and act on behalf of your constituents -- please vote NO on Bernhardt's confirmation, and defend our cherished wildlands, our climate, and our environment. Thank you.